A genus of more than 500 species, Aloe is a group of succulent plants native to Madagascar, Africa and the Arabian Peninsula. Among the various types of aloe plants that exist, a common trait includes rosettes of leaves with sharp teeth. Leaf colors vary from pale lime green to dark green and even blue and red. Many aloes also flower with tubular or bell-shaped flowers known as inflorescences. Flower colors include red, yellow, orange, white and green. Most aloes flower during the winter months, although some, like the well-known aloe vera, flower during the warm months. Aloe plant flowers are filled with nectar and provide a food source to pollinating birds, such as hummingbirds, and various insects. With so many types of aloe plants, there are many variations in growth patterns. Some plants are small and grass-like, only growing a couple of inches high. Other types of aloe plants grow into large trees with trunks as large as 60 feet in diameter. Aloe plants, especially the larger varieties, are long-lived. With their waxy, succulent leaves that hold water, aloe plants grow well in warm, arid climates that experience little rainfall. In such climates, aloe plants will thrive in rock, succulent and water-wise gardens. If you live in an area where there's considerable rain and freezing temperatures, you can successfully grow aloes in containers. Many aloes are frost tender, but some withstand cold temperatures. Those types of aloe plants that are more tolerant to cold weather may experience some damage in freezing weather but will quickly spring back. In climates that experience extended freezing temperatures, aloes can be grown indoors during the colder months of the year. The plants require bright light to thrive. Outdoors and indoors, grow aloe plants in full sun. Refrain from overwatering aloe plants. When grown in consistently moist soil, all types of aloe plants tend to rot. Avoid excessively moist soil by always providing aloes with excellent drainage in the ground and containers. Though they withstand drought well, aloes do require watering when the leaves become reddish-purple and curl, which is a sign of drought stress. The following aloe varieties tend to do well in home gardens. All add a striking element to the landscape. Some are more readily available than others. This aloe is native to the hot, dry mountains of Zimbabwe. In its native habitat, Aloe aculeata grows in grasslands and rocky areas. A stunning and sculptural plant, this aloe features large rosettes of light-green leaves edged with small, sharp spines. The striking summer flower stalks attract birds and butterflies. Grows in full sun to light shade. Reaches 3 feet high and wide. Flowers in the summer months with stunning tubular red and yellow flower stalks. Grows well outdoors in mild climates in rock gardens, raised beds and large containers. This aloe is native to areas that receive rainfall in South Africa, Zimbabwe, Mozambique and Malawi. Aloe arborescens grows into a large succulent shrub with branching stems featuring decorative rosettes. The rosettes are gray-green and sword-shaped with toothed edges. The plant creates a stunning focal point in the winter months when it flowers. Reaches 6 to 10 feet tall and wide. Flowers in the winter months with long, conical bright red to orange flower spikes. Can be grown near the ocean as the plant withstands salt spray. Native to South Africa, this aloe is hardy and easy to grow. It will withstand wet winters, providing the plant is grown in a container with good drainage. Lace aloe can even tolerate some snow. Aristaloe aristata is small and stemless with 6- to 8-inch rosettes. The leaves are soft and triangular and feature white, raised spots. These spots are located on the underside of leaves, and the edges of the foliage are finely toothed. Lace aloe flowers freely in the summer months, attracting bees and other pollinating insects. Grows in full sun to partial shade. Reaches 6 to 8 inches high and wide. Flowers during the summer months with pink, tubular flowers atop 10-inch spikes. Good choice for miniature succulent gardens. Commonly known as Aloe vera, this is by far the most well-known of the aloes. The plant features medium-green leaves. 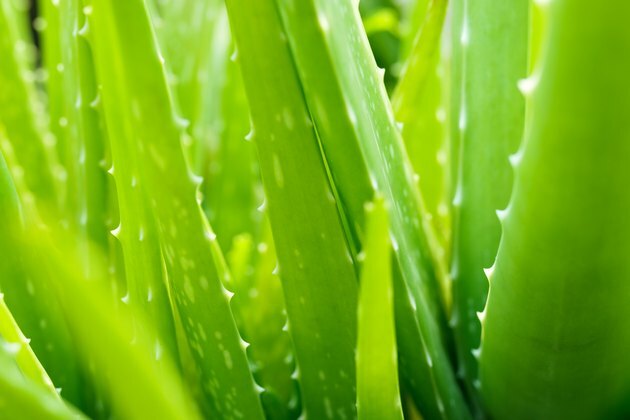 The gel from Aloe barbadensis leaves has been used for centuries as a first aid treatment for burns. Aloe vera plant gel is also widely used in cosmetics and lotions and as an herbal supplement. Reaches 2 to 3 feet high and wide. Flowers in the summer months with greenish-yellow flowers. Grows well in containers indoors and out. This low growing, clumping aloe is native to the Western Cape of South Africa. Aloe brevifolia will naturalize in mild climates, creating a carpet. The plant consists of compact 5-inch rosettes made of triangular-shaped leaves. Aloe brevifolia leaves are a gray-blue in color, turning pink or yellow in full sun. The foliage has white spines on the edges and sometimes the leaf surface. The plant features tubular flowers rising up above the foliage each spring. Low-growing foliage reaches 3 inches long and wide. Flowers in the spring with orange-red tubular flowers atop 20-inch stalks. Requires excellent drainage when grown in containers. This fast-growing plant is one of many aloe varieties native to South Africa. Aloe broomii features short stems and dense clusters of rosettes with light-green leaves. The foliage grows 1 foot long. Leaves have reddish-brown teeth along the margins, which curl. The plant sends up flowers atop tall spikes in the summer months. It's a fast-growing plant, reaching full size in just five to six years. Aloe broomii is a good choice for rock and succulent gardens in mild climates. Reaches 1 to 3 feet tall and wide. Flowers in summer with pale lemon flowers covered by long white bracts, reaching 4 to 5 feet tall. Native to Mozambique, Zambia, Malawi and Zimbabwe, this is considered one of the most attractive types of aloe plants. The plant provides a bright focal point in the garden. Aloe cameronii features low rosettes of dark-green narrow leaves with marginal teeth. The foliage turns red in the sun and when stressed for water. Reaches 1 to 2 feet high and 2 to 4 feet wide. Flowers in the late fall and winter with orange tubular flowers. In its natural habitat, this plant grows in rock crevices and on cliffsides. This fast-growing aloe is a climbing species that has the ability to sprawl or crawl 8 to 12 feet or even further. This species is from the Eastern Cape of South Africa where the climate is hot and dry and gets summer rainfall. Aloiampelos ciliaris has dark-green leaves with small teeth on the margins that are sometimes spotted with white. Leaf sheaths around the stems have margins sporting white hair-like teeth. The plant features tubular flowers from summer through late fall or early winter in mild climates. Reaches 8 to 12 feet high. Flowers most of the year with tubular orange flowers. Will naturalize in mild climates. This eye-catching aloe features bright-green rosettes in a light shade and coral-colored foliage in full sun. The leaves are flecked with white and feature distinctive teeth along the leaf edges. The plant features equally eye-catching flower spikes during the winter months. It works well as a ground cover. Reaches 6 inches to 1 foot in height and 1 to 2 inches in width. Flowers in winter with long spikes featuring greenish-yellow tubular flowers. Good choice for decorative container arrangements or to denote an underwater sea scene. This large, tall aloe comes from a variety of areas, including the South African Cape. Aloe ferox makes a striking statement in the garden, especially when in flower. Blooming occurs in late fall and early winter. Flowers are tubular and striking, featuring a bright-orange color. Leaves are gray-green in color and feature dense rosettes with dark-brown spines on the leaf edges. Reaches 6 to 9 feet in height and 3 to 5 feet wide. Flowers in the late fall and early winter with large, bright orange-red, tubular flowers. Aloe helenae is native to Southern Madagascar and is relatively rare as it's endangered. It's a tree aloe that can reach 20 feet tall. The plant has a slender trunk topped by shiny dark-green leaves. The leaves are curved and feature tiny red serrations along the leaf edges. The plant flowers in the late spring and early summer. Flowers in the late spring and early summer with tubular red flowers that turn to yellow. Will easily naturalize in mild climates. This attractive aloe is native to South Africa. Aloe hereroensis features pale green-blue foliage that curves inward. When hit by substantial sun, the foliage will take on a rose-colored or bronzed hue. Leaves contain bands of white spotting. The leaf margins have small red-brown spines. When the plant flowers, it's especially eye-catching. Each rosette features one to three flower stalks. Reaches 1 to 2 feet high and 1 to 2 feet wide. Flowers in spring with scarlet flowers. Native to South Africa, this aloe sports eye-catching foliage and colorful flowers. The plant forms rosettes of thick, sword-shaped leaves spattered by prominent white dots. Aloe maculata leaves are bordered by sharp teeth. When grown in part-shade, the foliage is bluish green but becomes pinkish red in full sun. The plant features eye-catching flowers from winter to spring. Reaches 1 to 2 feet tall and 2 feet wide. Flowers from winter through spring with coral-orange flowers atop 3-foot-high stems. Good choice for rock and seaside gardens. As its name suggests, this aloe is large, growing up to 15 feet tall on a single stem. It's native to South Africa where it grows from high altitudes to sea level. The plant features dense rosettes of large gray-green leaves fringed with red-brown serrations. The flowers are equally impressive and appear in winter. Reaches 8 to 15 feet tall and 4 to 6 feet wide. Blooms in the winter months with tubular orange to yellow or bright-red flowers. A remedy made from the leaves of this aloe was traditionally used to treat tapeworm. Is Aloe Part of the Cactus Family?